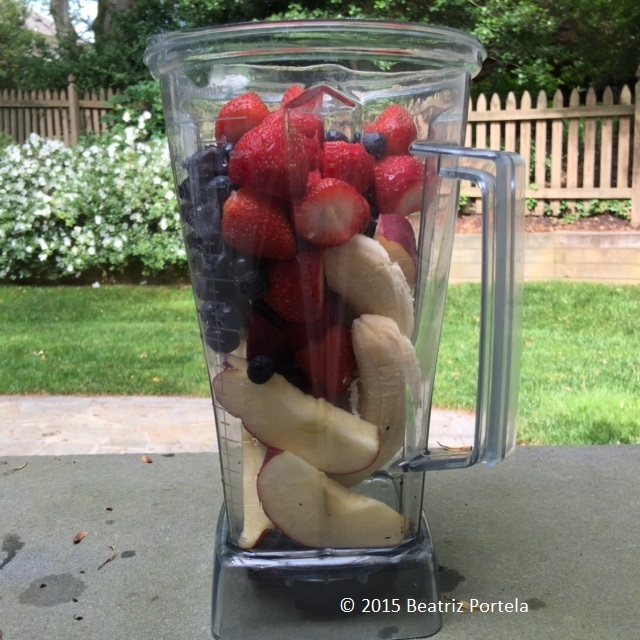 This is my new favorite smoothie–not kidding–it is sweet and delicious! If you’ve never had Carambola (Star Fruit), it tastes similar to grapes. I use the fruit fresh from my trees. If you don’t have access to carambola, you could replace it with seedless grapes. I haven’t tried it with grapes, so if anyone does, please let me know what it tastes like… Other recipes: Carambola/Blueberry Smoothie/Juice, Papaya/Carambola Smoothie. Toss them all in a good blender; add water and ice; blend until smooth. If you prefer a shake, replace the water & ice with ice cream and/or milk. You can use dairy milk/ice cream or soy or nut—whatever your preference is. Use fresh or frozen fruit, with no added sweetener. This is naturally sweet! It’s great for breakfast or as a “pick-me-up” during the day. I made this at my sister’s house in Maryland, for her family. That’s their yard in the background. Kidding! My sister asked me to bring mangos from Miami to her house in Maryland when I came up for her son’s high school graduation. Philip (the graduate) likes mango smoothies. 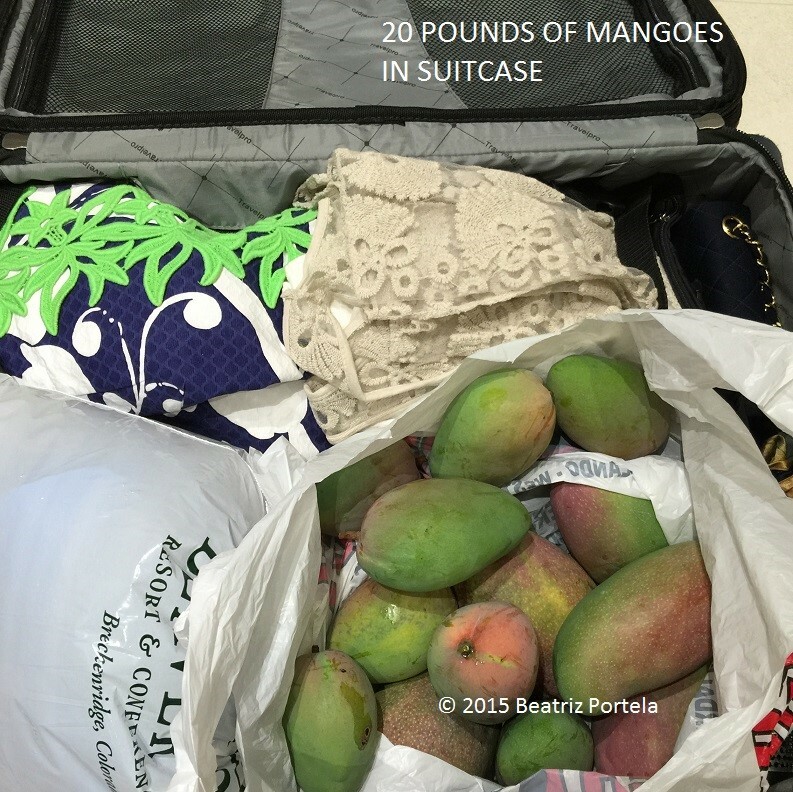 So I packed 20 pounds of the delectable goodness into my suitcase. I don’t mess around. Mango Smoothie Recipe: refrigerate ripe mangos. Slice and peel cold mango. Fill blender ¾ full with the fresh (or frozen) mango. Add enough water/ice to obtain desired consistency of creamy smoothie. If you prefer a shake, add milk and/or vanilla ice-cream instead of water. It can be dairy, soy or nut milk, whatever you prefer. I don’t usually add anything else because I love mango and have plenty of them…but you can certainly substitute part of the mango for other fruit like banana. dailypost_photo_challenge/on-the-way/ © 2015 Beatriz Portela and gardeningB.com. Excerpts and links may be used and are encouraged, provided that full and clear credit is given to Beatriz Portela and gardeningB.com with appropriate and specific direction to the original content. Any other use and/or duplication of this written material & picture(s) is prohibited without written permission from Beatriz Portela. It’s time to use some Parsley from my plants! 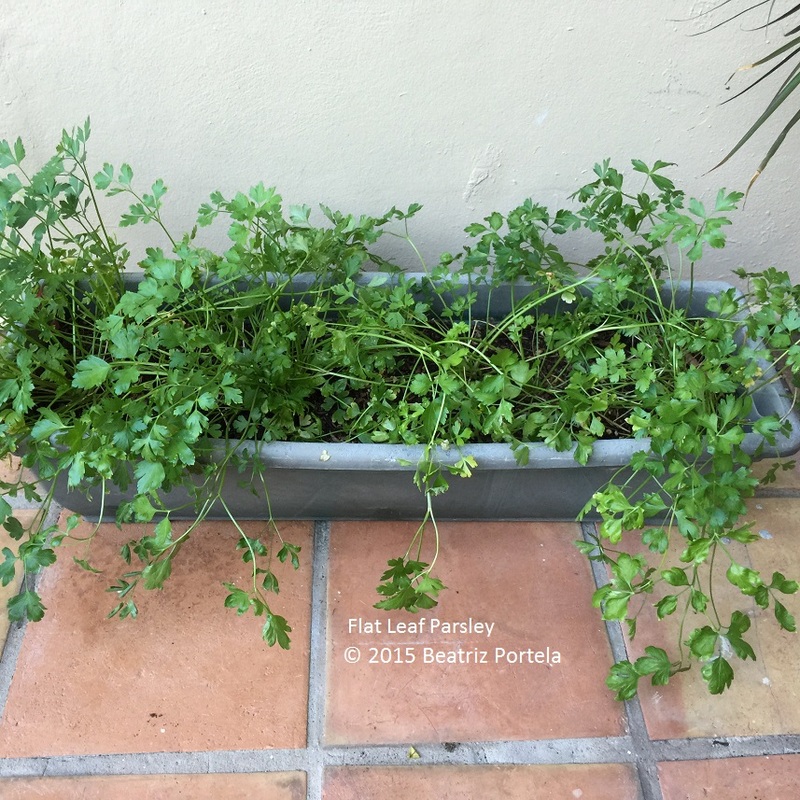 In South Florida and mild climates, Parsley is a perennial herb that can continue growing for 2 or 3 year. I think the best variety to use for cooking and juicing is the flat-leaf kind. Plant 3 plants in a box container or in the ground. The Parsley stems that have reached approximately a foot tall can be harvested. Cut the leafy stems from the base. This will help the plants continue growing bushier. The parsley can be used fresh, frozen or dried. 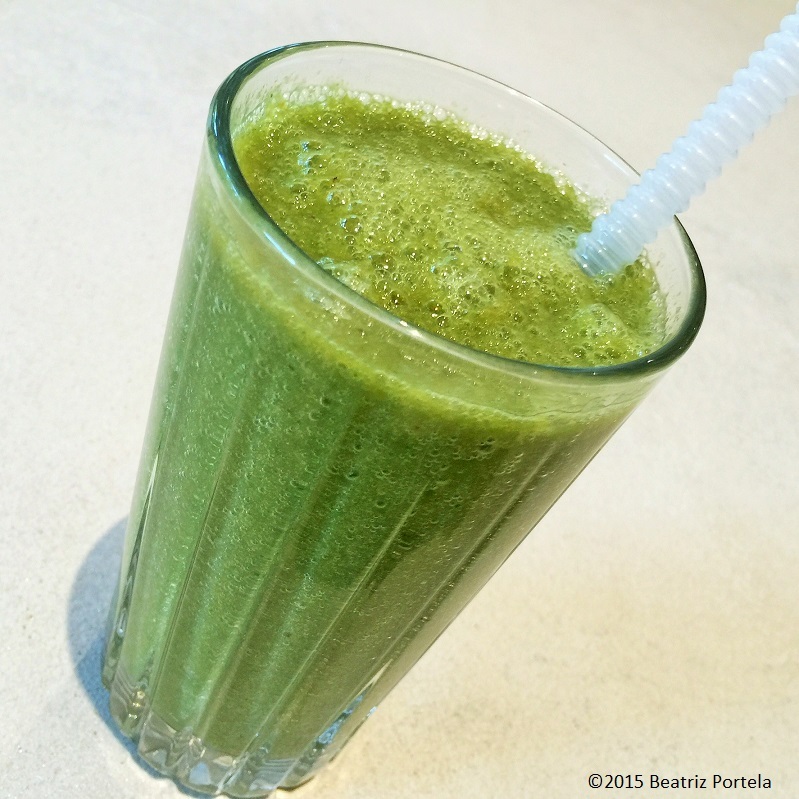 For the following recipe, use fresh or frozen parsley and a strong blender, rather than a juicer. I use a Vitamix Blender. Recipe: Core & de-seed Apples. Fill blender half-way with Apple. Fill the other half of the blender with the Parsley. Add enough water for the blended juice to get to desired consistency. 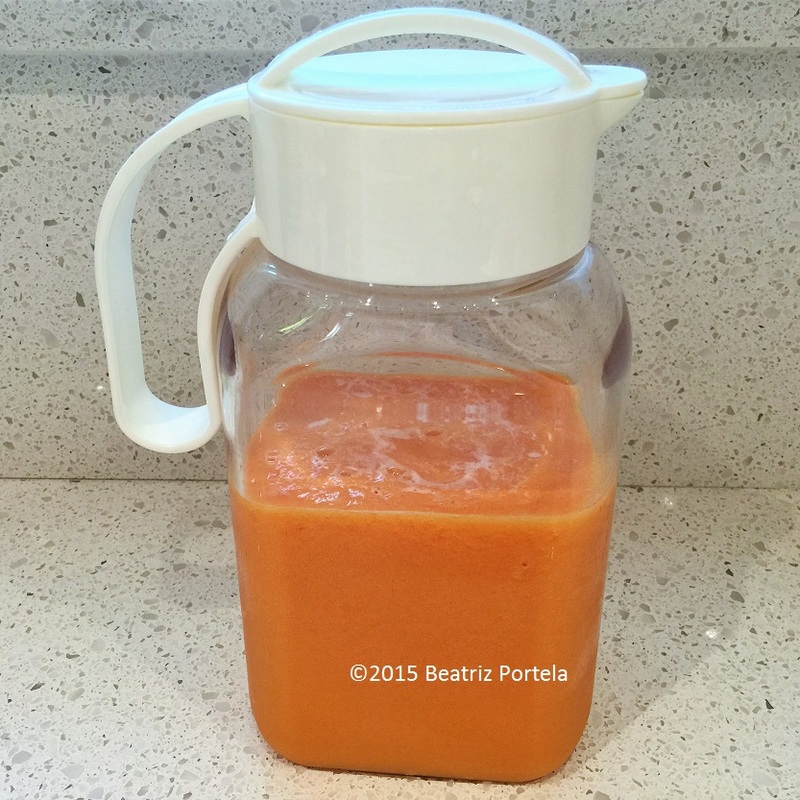 It should be sufficiently blended to the consistency of juice–cloudy in color but not “pulpy”. Enjoy! This is a sweet drink that is also nutritious. The Apple is high in anti-oxidants and the Parsley helps protect against inflammatory problems. RECIPE Ingredients: equal parts Papaya and Soursop, 1 or 2 Bananas (optional), enough water or milk to blend to desired consistency. You can use fresh or frozen fruit. The milk can be dairy, soy or nut milk–whatever your preference is. Directions: If using fresh fruit, cut the Papaya & Soursop lengthwise. Slice the peel off of the Papaya and Soursop and peel the Bananas. Discard the peels. 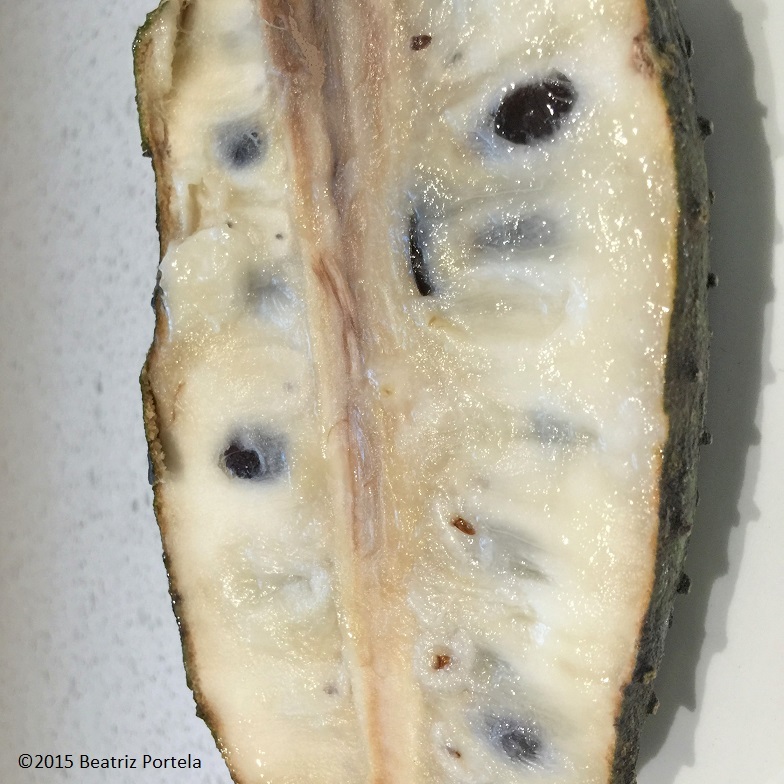 Discard the seeds from the Papaya and Soursop. Put all the ingredients in the blender and add water if you want a smoothie or milk if you want a shake. The bananas aren’t necessary, so if you don’t have any or don’t want to add them, that’s perfectly okay. I like to blend several fruits, if I have them, to maximize nutritional value. Today was the day that Jorge, the gardener, and his assistant came to do yard care. They maintain most of the yards on my street on a bi-weekly basis. It was a hot, humid day, as usual. Even though they have a cooler full of water in their truck that they go to, to satiate their thirst; occasionally I make a pitcher of fruit smoothie and leave it on my back patio for them. When I’ve been around to see them drink it, I’ve noticed that they don’t guzzle it down fast, standing up. Rather, they serve themselves a large plastic cup from the pitcher and go sit in the shade to savor the refreshing drink. It kind of reminds me of my macaw. When I give him something to eat he particularly likes, he doesn’t devour it on the spot. Instead he carries it to the highest perch in his cage and there he’ll proceed to eat. I think he can better watch his surroundings from the high perch and make sure no one takes away his prize. The fruit concoction I made today was a Papaya/Carambola Smoothie. The Papaya, I picked from my tree in the morning, and the Carambola (Star Fruit) I had picked a few months ago and frozen. It so happened that Ryan, the plumber, was in my house this morning doing some work in my kitchen during the smoothie ritual. So he received the first cup before I took the rest of the pitcher out to the gardeners. Ryan had never tried papaya before and was surprised by how sweet and tasty it was. I didn’t watch the gardeners, but I suspect they found a cool place to sit and relax while sipping their libation. And they probably had smiles on their faces. 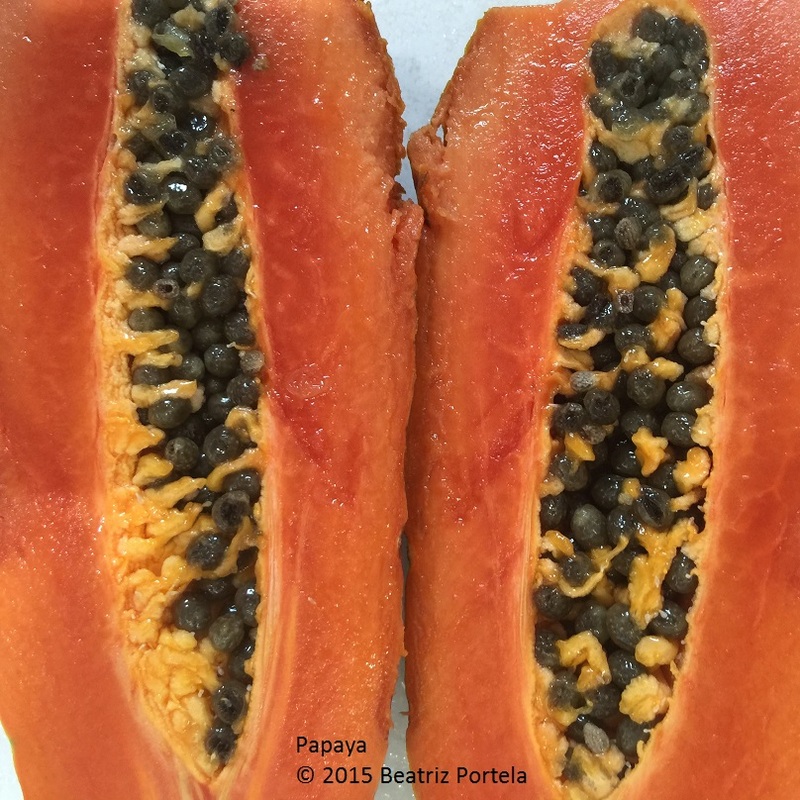 RECIPE: Slice the papaya length-wise, scoop out the seeds and discard them. Slice the Carambola and discard the seeds. 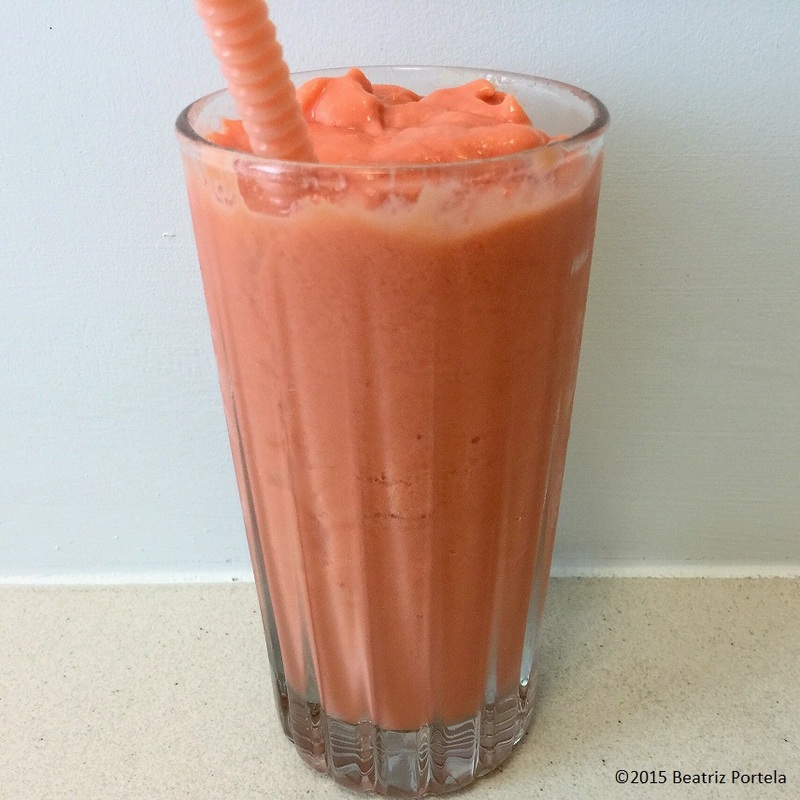 I put equal parts of the Papaya & Carambola in the blender and add enough ice & water to get a thick, creamy consistency when it is blended.